What is an open paint night like? A fun, social, group setting, with an instructor to guide you in replicating your desired door hanger. By the end of the session you will have an adorable door decoration! The event times vary but we suggest arriving 10 minutes early to get the seat of your choice. Events are 2 1/2 hours long and you can get up and move around as needed. Children under 16 are permitted as paid reservations. Yes, you will have to have a reservation to attend. Your wood cutout is pre-cut before you arrive and therefore we must have 36 hours notice that you will be attending in order to be prepared for you. You can register on the website or give us a call and we will be happy to walk you through the registration process. what is the cost of a paint session? The prices range between $35-$40 depending on the door hanger you choose. Fundraisers are usually a little more as both the guest and Kinsley’s Creative Palette will be contributing to the cause. We provide the Instructor, Wooden cutout, Paint, Brushes, and Aprons. Refreshments and alcohol are not included. You are always welcome to bring drinks and snacks! What is the size of the door hanger I will be painting? Our standard door hangers are approx. 20 inches in EITHER length OR height. We do offer initial cutouts, monograms and jumbo signs via special order. Does my door hanger have to look like the sample? Absolutely not!! I always recommend that you search Pinterest or Google images for inspiration. There are so many gorgeous signs out there! Some artists bring in saved images on their phones or printouts to look at while they recreate the design they like. We provide aprons, but you may want to wear something you wouldn’t mind getting paint on — just in case! We recommend arriving 10 minutes early to pick your seat. 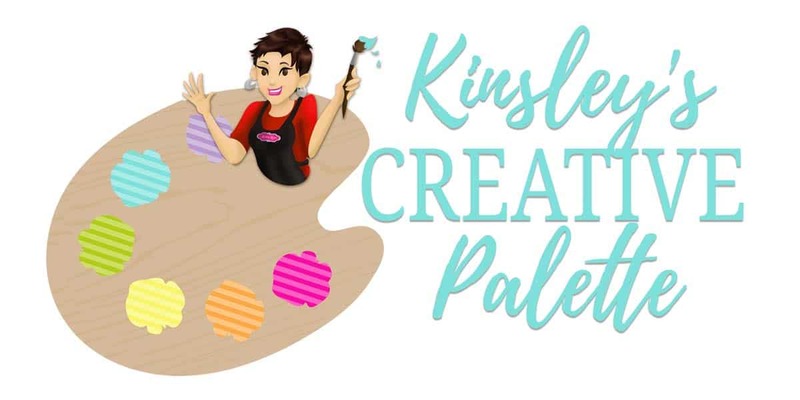 Kinsley’s Creative Palette is an entertainment event much like a concert, dinner theater or movie theater. We do not allow cancellations or reschedules as we pre-cut your product to order. If you are unable to attend, you can either forfeit your deposit or arrange payment to pay the cost of a blank wooden cut-out. Public classes are subject to cancellation without a minimum of 10 attendees. Cancellations are very rare and customers will be notified via phone and/or email of cancelled classes. The new schedule will post around the 15th of the previous month. We are always updating our schedule with new open studios, so please subscribe to our email list for updates. Corporate Team Building. Is a Private Event right for your corporate gathering? We think so! What could be more fun than sitting around painting (and laughing) your way to relationships?! And yes, we can come to you! Please contact Kara at kara@kinsleyscreativepalette.com for more information. Generally our requirements for a Private Event is 15 guests for weekends and 10 guest for week days. If you have fewer guests you are charged for the minimum that is required. Private events can be held at our studio or in a location of your choosing. A trip charge may apply outside of a 15 mile radius. Call (740) 616-0439 or email kara@kinsleyscreativepalette.com for distance and pricing.